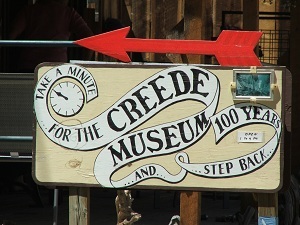 While spending your time in Creede, don’t miss the Creede Museum. 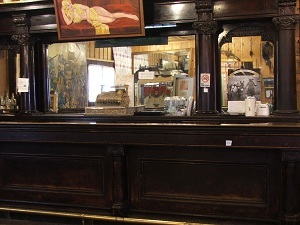 It is housed in the old Denver and Rio Grande Railroad Depot on Main Street a couple of blocks south of the Creede Repertory Theatre. It is open Monday through Saturday from 10:00 a.m. – 4:00 p.m. and on Sunday from 1:00 p.m. – 4:00 p.m. from Labor Day to Memorial Day. The admission is $2.00. The tour is self guided with a booklet explaining the exhibits. The railroad depot was built in 1892 during Creede’s boom days of mining. At the peak of Creede’s mining there were 10,000 people in the area. Creede’s original town site was located on East Willow Creek. Below Creede were Stringtown, Jimtown and Amethyst. Mining started in the area in the 1870’s and the last mine to close was in 1985. Of the many wonderful items in the Creede Museum, I enjoyed seeing the old black and white photos of the area in the 1890’s. These included pictures of area miners and the old towns of Creede. There are two tombstones which had the deceased person’s name carved in a piece of wood. A far cry from the tombstones of today! 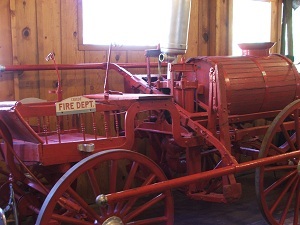 There is a piano which came in on a covered wagon, a man powered fire engine which came to Creede in 1893, a telephone booth, a manual hay baler, and a bar scene with a wooden bar which came out of an old tavern. As I looked at it, I could just imagine miners coming in, ordering a whiskey after a long day in the mine. 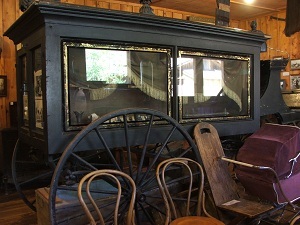 There is an old horse drawn hearse, clothing of women and children of that era, mining equipment, a mural of Bob Ford, and many other items. 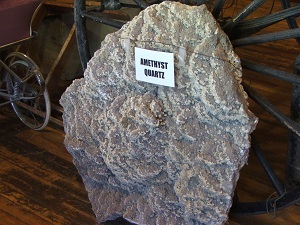 Don’t miss visiting this Museum while in Creede. It is well worth seeing but won’t take your whole day so you have time to enjoy the many things to do and see in Creede.